Freecycle is one of my obsessions. I found out about it years ago when my sister drove across town to deliver something she scooped up for my kiddos…It was this awesome freestanding basketball goal! From then on I have subscribed to the Freecycle website for their daily deal lists and have both given away items and picked up a few myself! A few months ago I responded to a posting that was listing cabinet doors in my area. 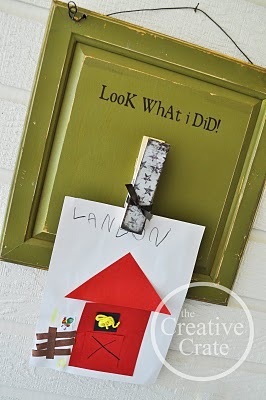 I thought “what the heck, let’s check it out” as I have seen many ideas of re-purposed cabinet doors like the post over here at Infarrantly Creative , and isn’t this one cute? I drove over and picked up the doors, the owner gifted about six of them and they were all brand new samples that were given to her from her cabinet maker for her new home. Cool! Right as I was picking them up the owner walked out and asked if I would be interested in some more wood items that she left out for another freecycler that was a no-show! I said a quick HECK YES! agreed to take the rest. I was very excited because my girls are also very crafty and always whining for me to take them to the craft store begging me for materials so this would give them a good start! 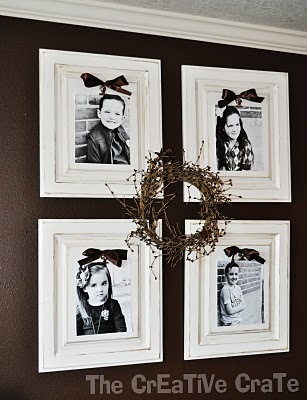 4 frames, 4 kids w/a crafty momma – I must try this! So in the meantime this is what I came up with. It hangs in my kitchen and took me all of about 10 minutes to create. It helped that I had all of the items on hand already. 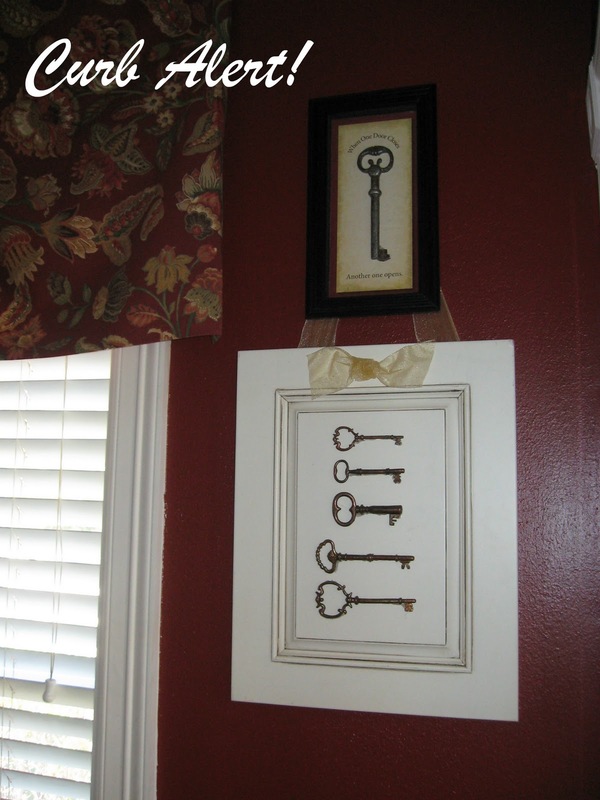 No sanding or painting needed, all I used was the keys ( I found in Fredricksburg years ago), glue gun and ribbon and PRESTO! I kinda like it. 🙂 I think it looks great! And I couldn’t stop there, I got our my ModPod, printed a quick saying on my computer in Edwardian Script font and glued it right on to the cabinet board. It sits in the corner of my kitchen counter and just kind of looks cute if I do say so myself! 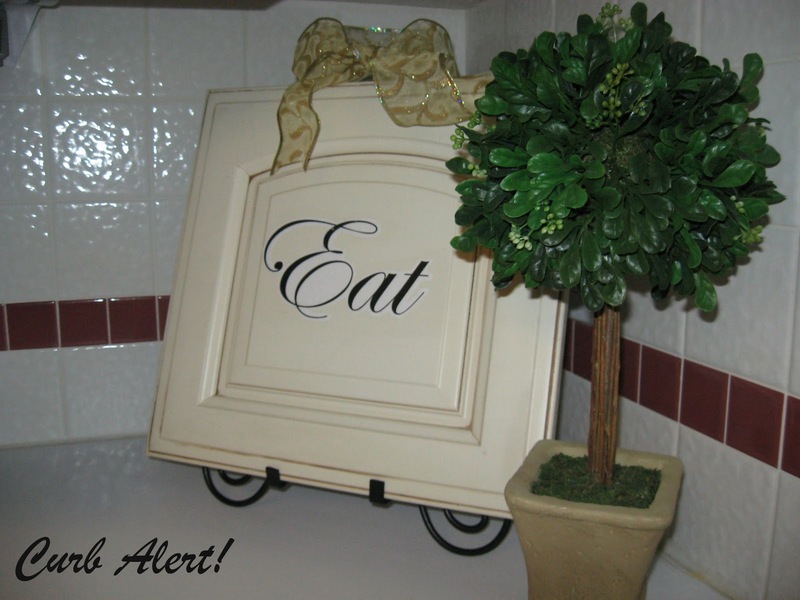 Not that we need to be reminded to eat around here! It’s raining today and we need it pretty bad so I am not complaining, but it does tend to mess up my weekly curb finds for Monday morning! Next Article I Was Featured! Well the basketball goal did not look like that until Dad & I powerwashed the heck out of it! Yep, I used to be the #1 Aunt…..untill Butterly got a BRAND NEW CAR from her other Aunt! Mooooove over Aunt Holly! Hey what was the deal w/ those mirrors….remember?? Love you! Cool place indeed, I would love to visit there. You grabbed some great stuff. Thanks for sharing. Love the keys, they turned out great! 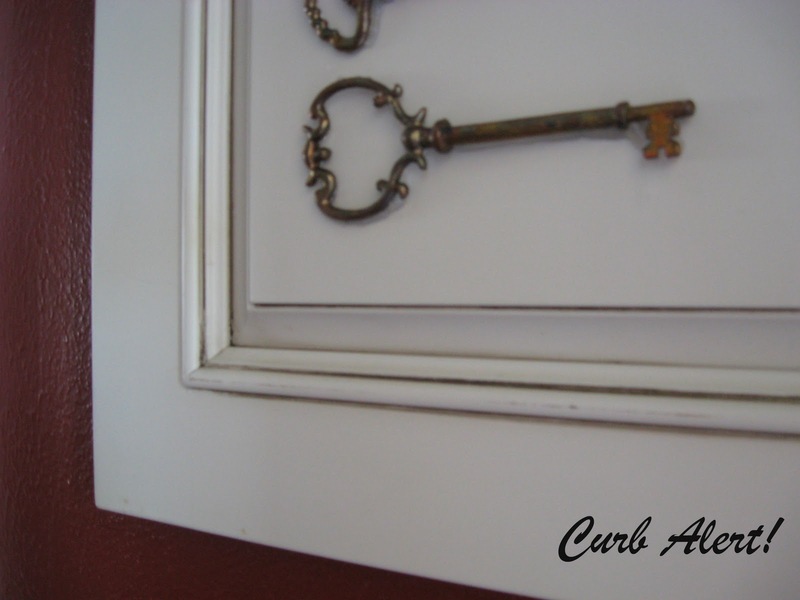 Great ideas for those doors. Wow that is an amazing stash of wood! 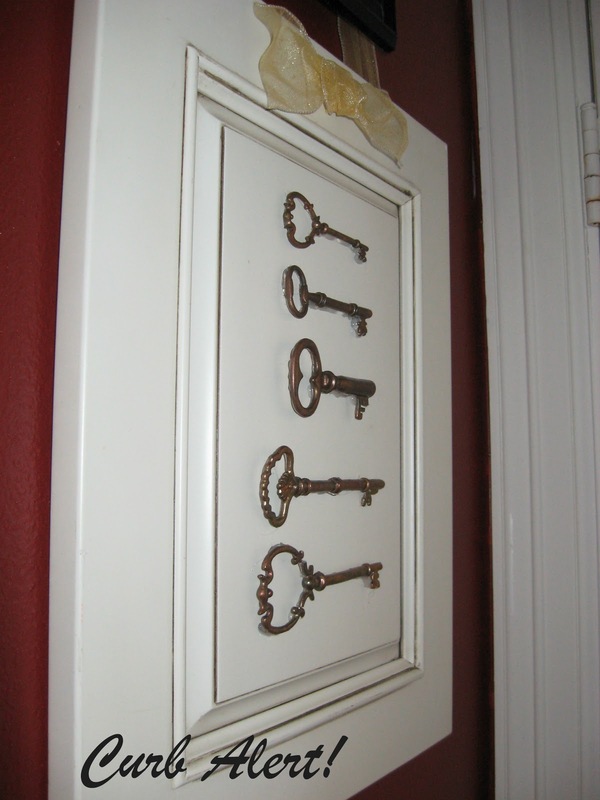 I absolutely love the idea with the vintage keys. Thanks for stopping by All Things Homie! Love your projects and am your newest follower!